“There are many restaurants in Siem Reap. But it is not easy to find a good One.” This statement does not come from me, but from a good friend who has lived in Siem Reap for a long time. One of those so who knows the city like the back of their hand, but he didn’t know about the Meng Cafe! This small restaurant is located in the Wat Damnak district in Siem Reap at the back of the Art Center Night Market (as it is called) – the market on the other side of the Siem Reap river. That is the side of the river that is less frequented by tourists, in comparison to the area around Pub Street. Around 20 guests can be accommodated at the rsturdy wooden tables of the Meng Cafe. At the entrance, a sign shows the current offers on the menu and further back in the restaurant you can see the Buddhist shrine for sacrifices. Overall, the decor is simple, here and there a little decoration. The first impression is that it is very much like any other restaurant in Siem Reap. Shortly after entering the restaurant, we realised that the Meng Cafe is a very special place. And that special something has a name: Morn Sokhon. Since December 2015 Sokhon has run the Meng Café with her husband Bunhak Khouen. He was a cook in a hotel and she a waitress in a restaurant. They both loved their jobs and so they decided to open their own restaurant. In all that she does we feel that Sokhon is the heart of the café. She wanders from table to table, keeping an eye on all the guests in the restaurant. Are they all satisfied? No, that’s not good enough … are all the guests really happy? Does the food taste good? Sometimes she runs over to the neighbour’s shop. He runs a small supermarket and always has exactly the things that Sokhon requires. Always – absolutely ALWAYS – we see a radiant smile on her face. A beam that is so inviting that it does not matter at all if the Khmer Curry will take 5 minutes longer than usual. There is also a waitress in the Meng Cafe, a relative who helps out when the restaurant is full or when Sokhon has something else to do. Unfortunately, I did not write down her name, but she deserves a mention here, especially since she does a really good job. On the illustrated menu, there are classic Khmer dishes such as Amok or Khmer Curry, as well as Western cuisine; burgers, french fries etc. We even discover Spaghetti Carbonara. The prices are very cheap – for just $ 2.50 you can get a complete dish. And the best thing is that all the dishes taste fantastic! Even the Spaghetti Carbonara Is just like the one we have at the Italian restaurant around the corner at home. It is at this very moment, that we are convinced Bunhak has truly mastered his craft as a chef. Breakfast – Khmer or American Style – is also on offer. The Meng Cafe is open seven days a week from 9:30 am, with just a few exceptions, for example holidays. From then on we go almost every day to the Meng Café- it seems to magically draw us in. And we do not seem to be the only ones. Right at the entrance we often meet the same two fellows, making themselves comfortable with their laptops and notepads. In broad American accents, they talk about God and the world. Of course, we join in. The Meng Cafe has thought of everything: all the tables have sockets, the Wi-Fi works well and there is even delicious Coffee “To Go” that Sokhon conjures up in her little kitchen area. Bunhak, Sokhon’s husband, and for a Cambodian, quite unusually slender of stature, is rather a rare sight. True, he is responsible for the meals we receive, but he sends the food up to the restaurant in a dumb waiter. Naturally I really wanted to write an article about this pearl in Siem Reap. This of course requires a nice photo. No sooner said than done – a photo-op is quickly arranged. And as we are in Cambodia, photos are important matters. Naturally their son Kongmeng arrives for the photo. He becomes an extra in the photos. Otherwise, I never even saw him in the restaurant. I have a new respect for Cambodians, I like them a lot. Mama Sokhon Morn, Papa Bunhak Khoven and their son Kongmeng Chhe. We discovered the Meng Cafe on our walk from our guesthouse to the town. 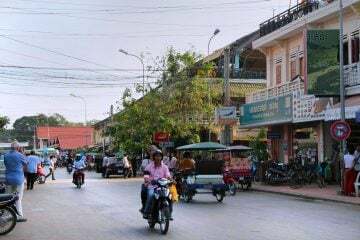 On the same street there is another Siem Reap culinary jewel, on the way to the ABBA Cafe. Another special place, which you’ll read more about in one of my next blog articles. Did you enjoy the post? Then simply click on Visit Angkor on Facebook. There you will find many more articles about Cambodia. Have you been to Meng Cafe? Then vote here and let me know in the comments if you liked it. What are your criteria for your favourite restaurant? Why do you prefer to go there? Whether at home or on holiday, let me know, I am very curious! If you like authentic Cambodian cuisine with a Cambodian twist then you are in good hands at the Meng Café. Tip: be sure to try the Khmer Curry, Chicken with Cashew nuts and the Spaghetti Carbonara. Beyond Angkor: 100 things to do in Siem Reap! Dank Deiner Empfehlung sitzen wir gerade zum zweiten Mal während unseres Siem Reap Besuchs im Meng Cafe.